The Monotype Corsiva™ font family was designed by typographer Patricia Saunders for Monotype Corporation and released in 1995. It is based on the early Italian cursives – particularly those created by Renaissance papal scribe Ludovico Vicentino degli Arrighi. The font is a sloped, serif design, featuring swash capitals and attractive rendering for formal use. The inspiration for Monotype Corsiva started very early on in the history of type design and printing. Long before the slab serifs of the nineteenth century and the minimalist designs of modern typographers, there were the elaborate, swashbuckling letterforms produced by the early masters of print. These early pioneers of the press were educated in the fine art of calligraphy and illuminated manuscript: a quality exuded by fonts like Monotype Corsiva. Corsiva in particular was heavily influenced by the work of Ludovico Vicentino degli Arrighi, a papal scribe active during the Renaissance period in Italy. Arrighi’s contribution to typography is certainly noteworthy: he was employed by the Apostolic Chancery in 1515 and produced a pamphlet on handwriting (namely the rendering of Chancery) in 1522 called La Operina. The 32 page woodcut production was well received and led to a number of other releases, the last one occurring just before the sacking of Rome in 1527, during which Arrhigi probably perished. Modern typographers have emulated his work – famous names like Robert Slimbach, Stanley Morison and Frederic Warde. It wasn’t until the latter half of the twentieth century, however, that Monotype Corporation commissioned the talented typographer Patricia Saunders (also known for her work on the Arial™ font) to produce a typeface suitable for formal purposes. 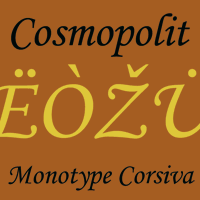 As a result, Monotype Corsiva was born and was released in 1995. Now a commonly held font and incorporated into software like the Microsoft Office suite, Monotype Corsiva has proven very popular among the general public and the designer community alike. It is one of the only commonly available fonts which, when seen in its Cyrillic form, contains the Te (a Cyrillic T with three legs). Being such a charming font, Monotype Corsiva is often used in formal settings such as event invitations, certificates and other important occasional material. Its letterforms are slightly too embellished for use in book publishing, but certainly legible enough on an invitation. Monotype Corsiva is also very popular in logo design, because its cursive quality fulfills the need for fancier lettering without rendering the result completely indecipherable. Examples of logos created with Monotype Corsiva include Cypress Properties in Santa Fe Springs, California and the DFW Artistic Roller Skating Club in Arlington, Texas. As a Chancery style font, Monotype Corsiva is continually popular with graphic artists, designers and the general public and will very likely continue to be so.